Finding the positive side of divorce is not always easy, especially when you feel like you've been run over by a Mack truck. But the truth is divorce gives us the opportunity to start over again more intelligently. Plus, when you look for the positive in a situation, it's a lot easier to accept what life hands you. The Rolling Stones were actually very smart. They were dead-on when they sang that you can't always get what you want but you get what you need… that is if you are paying attention to what is being offered. When we wish, pray or hope for something, what we actually might be gifted with is the situation in which to manifest that gift. All too often, we don't recognize the opportunities in life. We see obstacles instead of openings. Divorce is a perfect example of hidden opportunities. At first we cannot see the forest through the trees. We are in pain and our perspective or outlook is very limited. 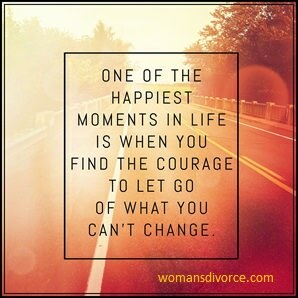 We don't realize that our divorce has many gifts or opportunities for growth. They are hidden from view but the challenges that lay before us are actually chances to become the person we were always meant to be. When her marriage fell apart, she was devastated and claimed she could not understand what had happened. After working together, she was able to face the fact that she had been an enabler of her husband's behavior. By not standing up for herself, she gave him a green light to do whatever he wanted. In addition, by refusing to confront the reality of her marriage, she failed to do take the necessary actions that might have changed the situation for the better. Seeing the truth she now chose to take responsibility for herself and her life.